The three main types of nursing roles are certified nursing assistant (CNA), licensed practical nurse (LPN), and registered nurse (RN). CNAs provide bedside care and perform basic nursing procedures for sick, elderly, or rehabilitating patients. LPNs conduct more complex procedures, like dressing wounds or measuring vital signs, in a variety of medical settings including nursing homes, hospitals, private homes, and schools. RNs play a more senior healthcare role by independently directing patient care, administering critical activities, and consulting directly with physicians. More senior nursing roles require progressively more education. For example, Ohio’s CNAs need only complete a brief certificate program, typically eight to ten weeks in length. Prospective LPNs must complete a lengthier certificate program, requiring 12 to 18 months of fulltime study. Aspiring RNs can pursue one of four pathways: hospital diploma, two-year associate’s degree, four-year bachelor’s degree, or direct-entry master’s degree. Nursing licensure programs are offered at several accredited nursing schools in Canton, including Malone University and Kent State University at Stark. Thankfully, more education also correlates with higher pay. For example, Canton’s 2,900 CNAs earn a median annual salary of about $21,000, while the city’s 1,500 LPNs take home $36,000 in average pay. 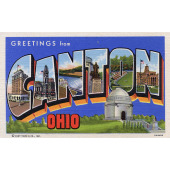 Canton’s 4,100 RNs earn almost $57,000 per year on average; those with a bachelor’s degree can make $66,000 or more. Major local nursing employers include Maxim Healthcare Services and Akron Children’s Hospital. To help those launching their Canton nursing careers, we have identified below the city’s best accredited nursing schools and programs.